Rural Commuter Rail in Ottawa? 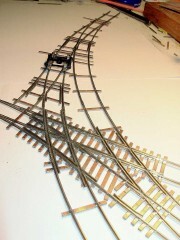 The Central New Jersey’s Bronx Terminal apparently had some insane trackwork; what’s crazier is that Tim Warris has taken it upon himself to create a model of that terminal, hand-laying all that complicated track. He’s just started a blog to take us step by step through the design and construction process. Excuse me while I pick up my jaw; I seem to have left it on the floor somewhere. Via Coxy.